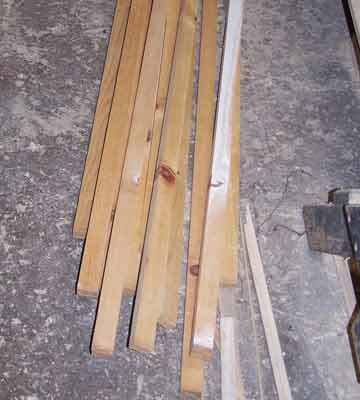 Since my plywood still had not arrived I decided to start on the boom, mast and sprit for my fabulous future Skerry. A trip to my local building supply store convinced me that the current supply of spar quality spruce 2x4 was non existant. I also had a good supply of old pine shelves I had kept when we bought our old home. The wood was nice and dry and solid perfect for shelves but had quite alot of knots. I had run across a couple of web references on Birds Mouth method of mast building so I ran a rough test and it seemed to work very well. I decided I would cut out the knots, scarf join the boards knot free, then make a hollow bird's mouth mast. I figured I would add solid reinforcement inside the hollow mast where things attached to the outside so that the spars would not be weakened by screw holes. I knew that bird's mouth method is slight overkill but I was curious in the method. Another factor was my preference for a round mast rather than a square one. Being eternally optimistic and confident of my superior woodworking skills I happily started and realized there was more than first met the eye! Narration is slightly out of synch, this happened when I put it up on YouTube. 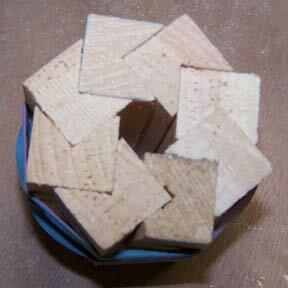 Everyone should try a SMALL sample of bird's mouth joinery. It is fabulously rewarding and fun. You can cut the v in the end of the board with a table saw or with a router. Because epoxy resin with filler is very forgiving slight imperfections dissappear. You can see one of the board's v is over cut. This is one of my set up board I just cut up. 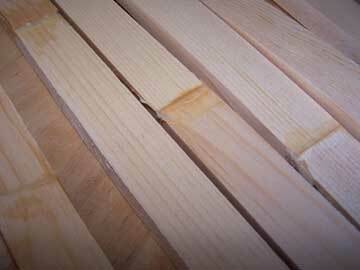 I used a thickness planer to get the boards to three quarter inch thickness because they were old and not uniform. This is thicker than I need as I found out with the boom. The birds mouth method allows for a much thinner wall and still provides enough strength. I makes a very solid boom! If I get attacked by pirates I can use it to defend myself. Test for birds mouth mast assembly. Notice that the inside is not perfectly smooth because I cut my v slightly short of the full width of the wood. I was testing the set up and just assembled my set up boards. My set up for cutting even boards. It keeps my fingers from the blade. I used the same set up for the notch except the blade was tilted. 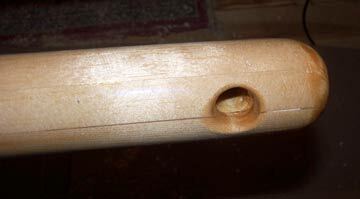 I've cut scarf joints in my now knot free wood. I like to think of my mast as a patchwork style. All my boards are nicely taped together and ready for gluing. I made sure that my joints are all staggered. Hopefully they will not show up too much. I think having the vertical lines will look ok but I think the skarfs will not be so nice. I should have paid more attention to the colour of the boards I was joining together but I didn't. 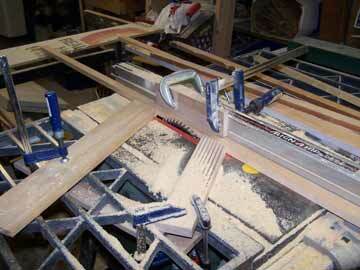 I made a nice jig to use my router to cut the scarf joints but it was faster and better made with a block plane. Clamping the scarf joints together was more difficult than I had bargained for. Particularly since I had to figure out what I was doing as I went along. I eventually made a bunch of boards with little straight boards glued on them to help me align the 2 sides of the joint. 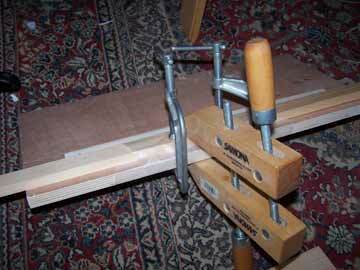 I just clamped everything to the board with waxed paper in between clamp and wood, and it worked quite well. The squeezed out glue came off when I sanded and planed off the boards using a little block plane. Once they were clean I cut the V in each board. I'm working on the boom here. It's only about 6 feet long. I will have to cut the notch for the birds mouth assembly before I assemble the scarfs for the mast because I can't get a 12 feet board out of my basement where the table saw lives. Because I was quite accurate in my cutting, this was not a problem. At this point I also cut a taper in the pieces before the birds mouth assembly. I used my little block planes very sharp, and planed the edge opposite the notch. This resulted in a slight taper. When I assembled I made sure I had a couple of little sticks to put under the Birds mouth mast so I would not glue it up crooked. All the pieces are covered with thickened epoxy resin on the inside and I've cut octagonal reinforcements to place in spots where I plan to screw some cleats on the mast. (I'm working on the mast here.) There is a reason I don't have any photos of gluing the boom together. Everything got very sticky and started wiggling out of alignment. I was trying to assemble the 8 pieces PLUS the inside reinforcements where there are cleats attached or holes to be drilled. 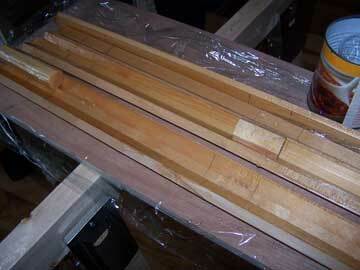 The reinforcement for the birds mouth spars were cut from a nice lenght of 2x4. I did it free hand on the table saw and allowed some slack to be filled with thickened epoxy in case of gaps. 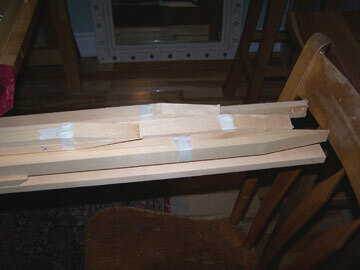 A couple of the boards had twisted and were quite warped by the time I started assembling. This made it very difficult to control the whole mess. Another set of hands would have helped. It made no difference in the end though. I finally managed by tying down one end relatively loosely and going to the other end and pushing the reluctant bits together. Everything was covered in epoxy and my nose got itchy in the respirator. It's a lot harder to work with long pieces than the small pieces I tested with! Luckily for me I was using slow set epoxy and had the time to work. I had covered my workspace with plastic wrap and this helped too. Eventually I had tied my birds mouth mast every 6-8 inches with nylon rope. I tightened this with a stick twisted inder the rope. There was no real rush. I also got my hands on a few small pipe clamps and put a couple together to go around the mast. I gradually tightened each rope and then came back and did it again till I was satisfied that there was some squeeze out but the joints were not starved for glue. The squeeze out was scraped off at this point and saved quite alot of work later I think. After letting everything set I used my little plane to start rounding. It worked really well and soon I had a roundish stick. Finally I used a long strip of sandpaper by hand like I would polish a shoe. I had a roll of really coarse stuff, about 40 grit. This really worked well to round the spar. There is a company in South Africa that makes birds mouth spars and they strongly recommend NOT to use epoxy and they must have had a bad experience. They used Resorcinol glue. Here is my page on Resorcinol-formaldehyde glues. It is quite an amazing adhesive in its own right. HOWEVER I did alot of reading and my experience supports the use of epoxy, Resorcinol would also have worked for gluing. 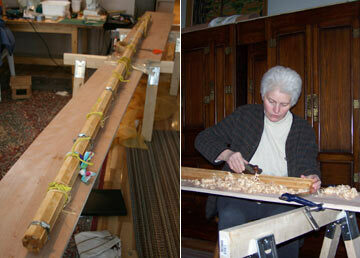 I have had no problem with the spars and likewise many people have used epoxy with great success. Maybe they had a bad batch? This is the boom. It has rounded quite nicely and the joints are almost invisible. The scarfs are curved and look like wood grain. The angle of the photograph makes it look clunkier than it really is. I guess I will cover it with epoxy but I will wait until I have figured out where I need to cut the holes. Once the grommets are in the sail I will make sure it aligns properly. I use a stud finder to locate the little reinforcing plugs I put in the spars. I measured and noted the location but it's usually faster than looking for my note book! I've roughly rounded the mast and sprit. I still need to cut to size and finish but for now I have my mast, boom and sprit. Boom fork gets a couple of holes. 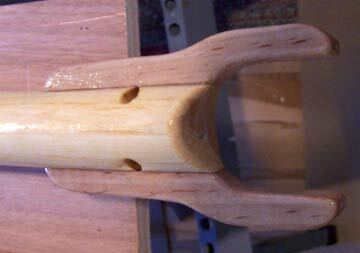 Boom now has a hole at the far end and a couple of holes in the fork as well as a coat of epoxy. I will put 3 coats on all the wood and then put a few coats of varnish. The mast top has a nice big hole which I made quite smooth to allow for a rope to easily slide through if I decide to put a different rig than the sprit sail. 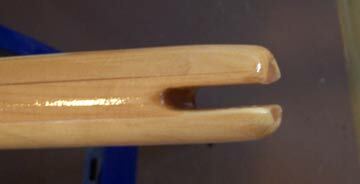 sprit has a dowel at the top and a slot at the bottom where the snotter fits through. Top of sprit fits in loop attached to sail. 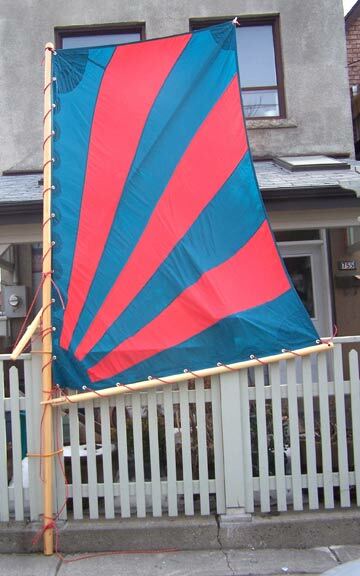 Later I had to lengthen the sprit to accommodate a larger sail. Read about the modification of the sprit here. 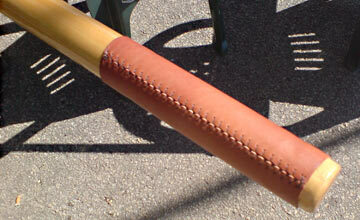 For instructions on how to leather see my page on leathering oars. 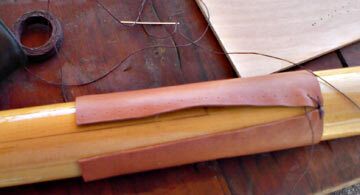 The mast was being scratched by the snotter, boom and the base so I decided to leather it where the rubbing occurs. I took a piece of vegetable tanned light leather, punched some holes for the stitching, wet it and and sewed it together tightly. After the stitching was done and the leather dry I coated it with oil. Larry McInnis Makes Birds mouth Spars He's planning on building a Skerry and decided to make some spars.